Garden design – that’s just about where you put plants, isn’t it? Garden and landscape design are really just getting the planting right isn’t it? Plants ARE important – they are just not THE most important thing when it comes to garden design. 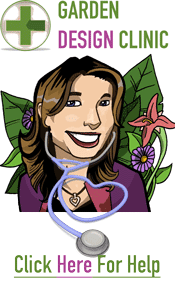 I can feel the tut tutting as you are reading this – ‘not about plants, what’s she talking about!’ You are probably not convinced, thinking you are reading the ramblings of a crazy woman. That’s OK. Like many misconceptions, it’s going to take a bit of persuasion and coersion to set the record straight. So if garden design isn’t about plants – what is it about? Well cake, actually. Yes, glorious, delicious, icing covered, cake. Think of plants as the icing on the cake, NOT the cake itself. They finish it off, make it look pretty and make the garden feel like, well, a garden. Really GOOD garden design is about the shape first, then the plants. Shape is so important because it provides the framework that the plants sit in. If the shape or main body of the garden is well thought out, then the whole garden works as one entity, not just a hit and miss of plants dotted here and there. They get hung up on the icing. The pretty bits – the plants. If you just focus your design on what plants you are going to put in, chances are you’ll create a chaotic plant paradise but not a great garden. For some people that’s fine. BUT I suspect, not for you. The fact you are here reading a blog about how to design your garden better, means you are one of the VERY FEW smart people. I’m actually not trying to butter you up with flattery – it happens to be true, MOST people don’t plan, they don’t think ahead, they just go plant things! If you are one of the many that have made this mistake in the past, don’t worry, you are in very good company – everyone does it. The reason we all head straight for the garden centre is plants are nice and we don’t know what exactly what else we should be doing, so planting the garden is the most obvious and logical thing to do. So what should you do if you want a well designed garden? The quick answer is to plan it first. Going back to my cake fixation (writing a blog at tea time, when I’m hungry, maybe wasn’t such a good idea) decide what shape cake you want before you even CONSIDER what colour and flavour the icing is going to be! You probably wouldn’t serve a pile of icing on a plate, so make sure you don’t just focus on the plants in the garden – make something really delicious, with a well thought out and planned garden. I am one of those you mentioned, plants already there and I am not happy about my garden look. I am convinced of what you say, the shape is the basic. That’s what I need, and i am looking forward for your advice and help to assist me to redesign my small garden. Kindly let me what I have to do to achieve this goal. Thanks for your comment. For a small garden the quickest way I can help you is through the Small Garden Design Formula – this walks you through everything you need to do, step-by-step and includes video tutorials. Alternatively, I am putting on a free online garden design workshop, which you can sign up for but the workshop doesn’t focus on small gardens, it’s garden design in general and is a few weeks away yet. There are also plenty of articles here on small garden design – just do a search at the top or by category to find them. Hope that helps you. Keep us posted on what you do with your garden.